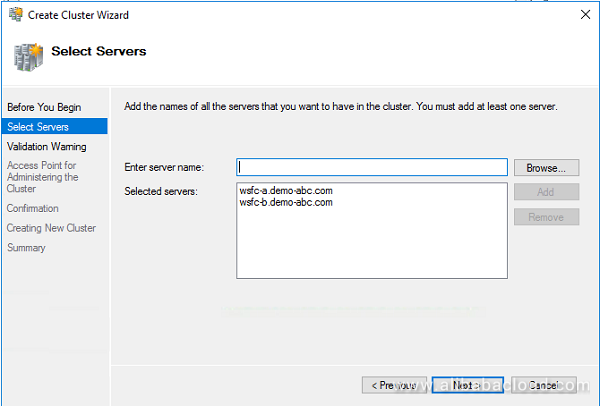 In this tutorial, we will show you how to deploy Cross-Availability Zone (AZ) Windows Server Failover Clustering (WSFC) on an Alibaba Cloud Elastic Compute Service (ECS) instance. WSFC is a feature of the Windows Server platform, which is generally used to improve the high availability of applications and services on your network. 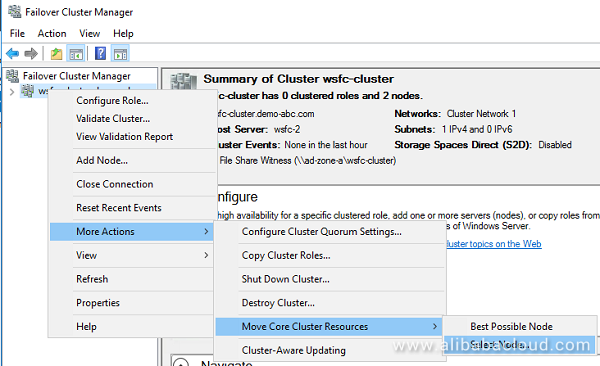 WSFC is a successor to the Microsoft Cluster Service (MCS). 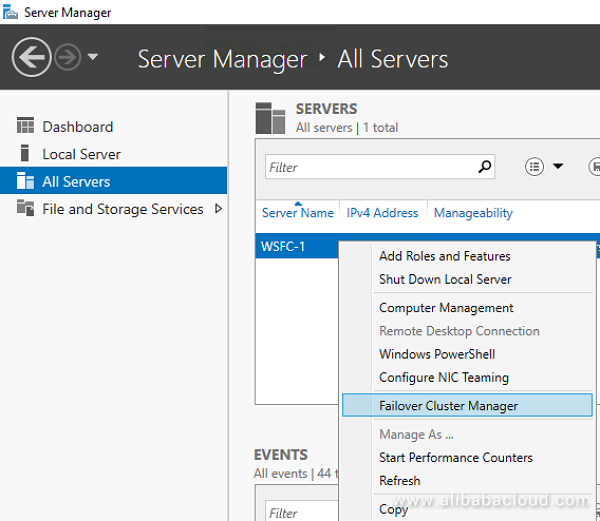 We recommend you use Windows Server Failover Clustering (WSFC) and SQL Server AlwaysOn Availability Groups as your SQL Server high availability (HA) solution on Alibaba Cloud's Elastic Compute Service (ECS) instances. 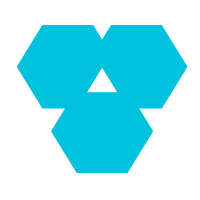 In this tutorial, we deploy a Cross-Availability Zone (AZ) WSFC on an Alibaba Cloud ECS instance. 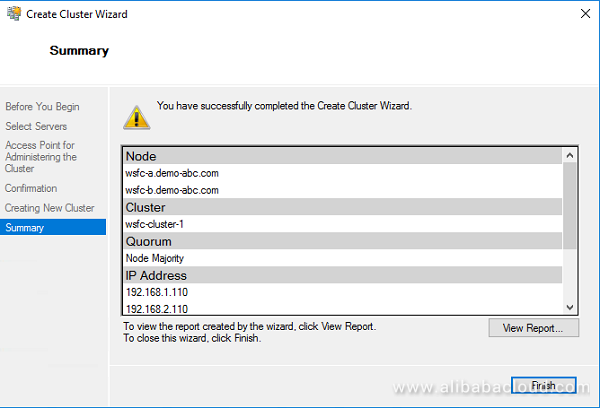 This tutorial assumes a basic understanding of Alibaba Cloud's suite of products and services, the Alibaba Cloud Console, failover clustering, the Active Directory (AD), and the administration of Windows Server. • A primary ECS instance running Windows Server 2016. • A secondary ECS instance, configured to match the primary instance, running in another Availability Zone. Resolving hostnames to IP addresses. Hosting the file share witness that acts as a third "vote" to achieve the required quorum for the cluster. Note: the quorum is sometimes referred to as the Disk or File Witness. It is simply a small clustered disk which is in the available cluster storage group. When the cluster fails, requests must go to the newly active node. This routing is usually handled by the address resolution protocol (ARP), which associates IP addresses with MAC addresses. However, in Alibaba Cloud, the VPC system uses software-defined networking, which does not provide MAC addresses. This means the changes broadcast by ARP don't affect routing. To make routing work, we need to make use of an Alibaba Cloud product called HAVIP (Highly Available Virtual IP). In this scenario we need to form a cluster across two different subnets in two availability zones. So, we will need to employ two HAVIPs. 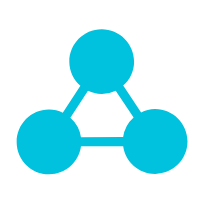 Failover clustering moves any cluster resources and roles from the failing node to the best node, as defined by the quorum. This action includes moving the associated cluster IP addresses. Failover clustering broadcasts ARP packets to notify the hardware-based network routers that the IP addresses have moved. For this scenario, the HAVIP in the other subnet/availability zone will pick up this change and will promote the corresponding instance to become the new master, and the cluster DNS will now be mapped to the new HAVIP address. That's it! Let's start the tutorial from the Alibaba Cloud Console. First, login to your Alibaba Cloud Console. We are now going to set up your Alibaba Cloud account to work with the WSFC environment. 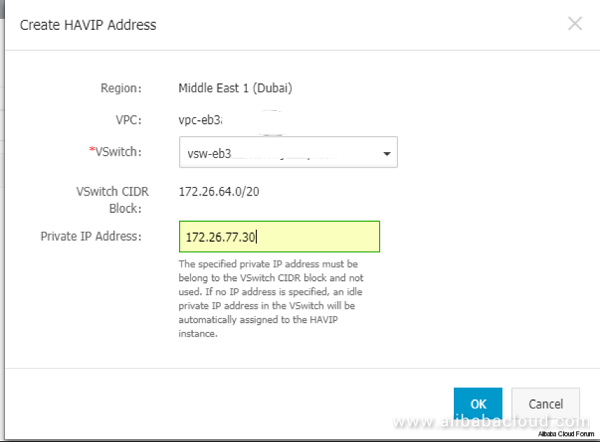 In the Alibaba Cloud Console, find and click "VPC" on the left-hand menu. Then, click "Create VPC" and follow the on-screen instructions. In the Alibaba Cloud Console, find and click "Elastic Compute Service" on the left-hand menu. Two ECS instances to form the cluster, which are in separate availability zones. Call these instances "wsfc-a" and "wsfc-b". One AD instance, in one of the two availability zones of your ECS instances. Call this instance "ad-1". Remember to select "VPC" for Network Type and "Windows Server" for the OS when creating these ECS instances. Next, we need to create two HAVIPs, one in each availability zone, and then bind the corresponding instance to that subnet behind the HAVIP. In Alibaba Cloud, all IPs on any VPC and underlying switches are assigned dynamically. 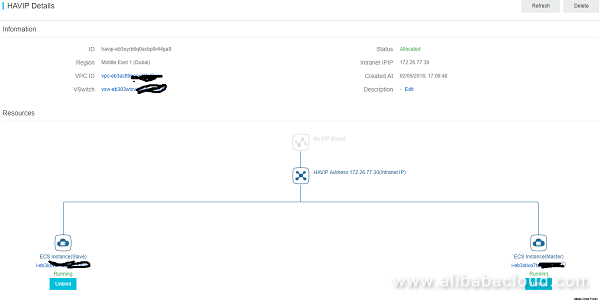 So, you must use "HAVIP" to configure a static IP that can be used as Virtual IP for Windows Server Failover Cluster and other application clusters on ECS. By default, HAVIP button is not available for use. So, you will need to log a support ticket "To whitelist HAVIP". Click on "Create a HAVIP Address". The Primary should be called the "Master", while secondary is known as the "Slave". Check this new HAVIP is reachable from the ECS instance. If you can successfully ping it, this IP can now be used for your Windows Cluster. Use RDP to connect to the wsfc-a instance. Before we can join this instance to the domain, we need to perform one fix on the duplicated SID because of the nature of the public image that we used to create the instance. 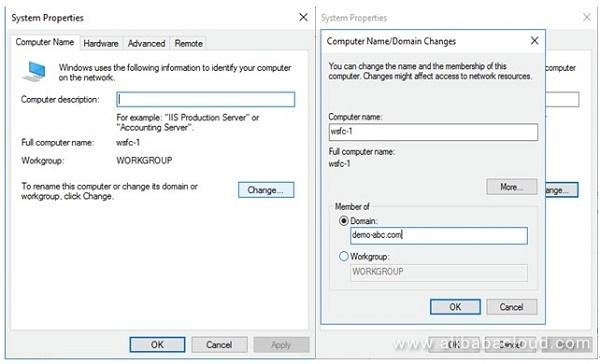 Restart and then connect back to each instance and open a PowerShell terminal as Administrator. Enter the credentials of an account with the permission to join the domain when prompted. Finally, restart the instance to complete the operation. Repeat the above steps for the wsfc-b instance, adapting to its own static IP address. Use RDP to connect to the wsfc-a instance with the credentials we created in previous step. Restart to complete the configuration. Repeat steps 1-3 for the wsfc-b instance. Now we are ready to create the cluster. The subsequent steps can be performed on either one of the instances. Click the Select Servers page and add both servers. 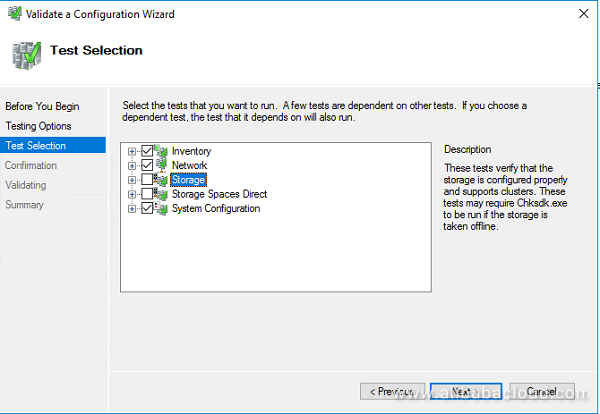 Click Next and keep the option to run configuration validation tests. 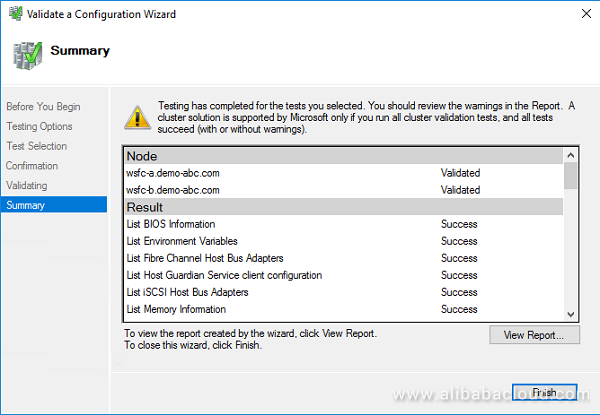 Click Next to get to the Validate a Configuration Wizard screen. On the Testing Options page, select Run only tests I select, and then click Next. Unselect Storage on the Test Selection page as the Storage option will fail in our setup (as it would for separate standalone physical servers). 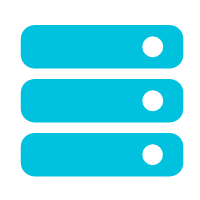 Shared storage is needed for traditional failover-cluster instances (FCIs) where every node needs to see the shared storage locations where data and log files reside, but in the cloud, we would favor a solution like SQL AlwaysOn that doesn't require shared storage. Click Next twice to run the tests. Make sure none of the tests have failed. Only one network path between replicas. Previously for physical servers, we would build a separate cluster heartbeat network. Because you are now working with the cloud, you can ignore this one. Windows Updates may not be the same on both replicas. If you configured them to apply updates automatically, one of them might have applied updates that the other hasn't downloaded yet. Pending reboot. We might have made changes to one of the servers, and it needs a reboot to apply. Click Finish to return to Create Cluster Wizard. 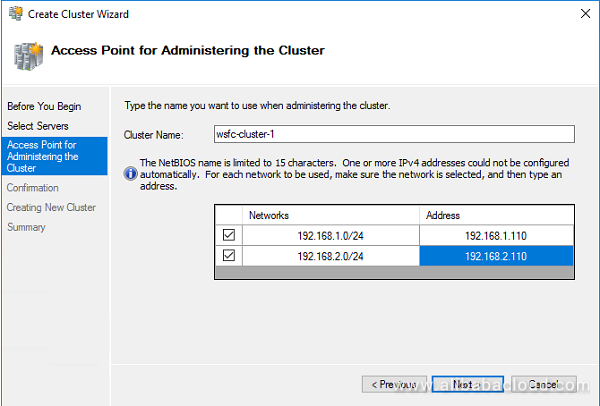 Name the cluster wsfc-cluster-1 on the Access Point for Administering the Cluster page and specify the two HAVIP addresses as the cluster IP for each subnet. Click Next twice to create the cluster and then Finish to complete the wizard. We can also uncheck the Add all eligible storage to the cluster option for now. 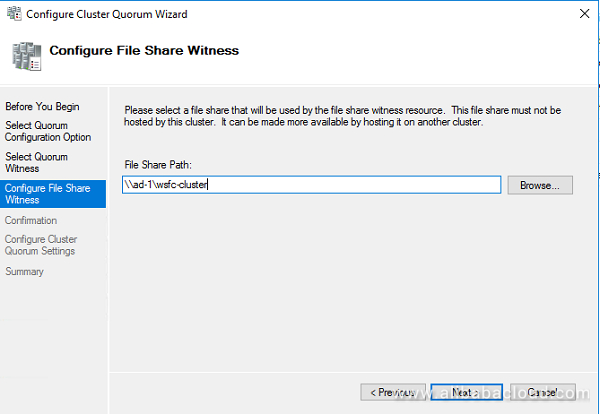 We can now move on to create the file-share witness to help the cluster to achieve quorum. 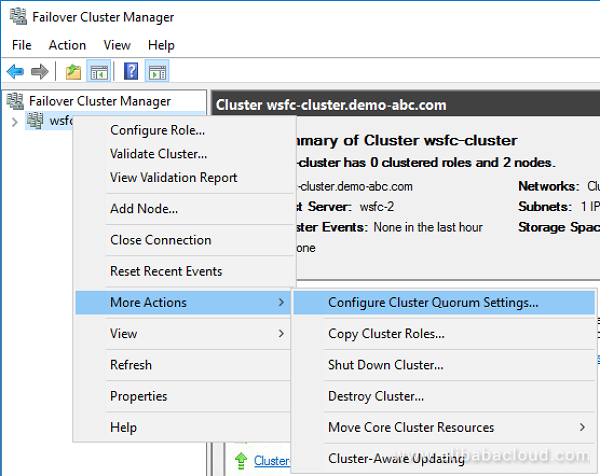 Right-click on the cluster, select More Actions and then Configure Cluster Quorum Settings. Select the option for Select the quorum witness and then click Next. Select the option for Configure a file share witness. Select Browse option, and then create a new file share on the AD instance ad-1, and click Next. Click Next after confirming the settings. In the HAVIP web console, both servers in their respective HAVIP have been promoted to Master. 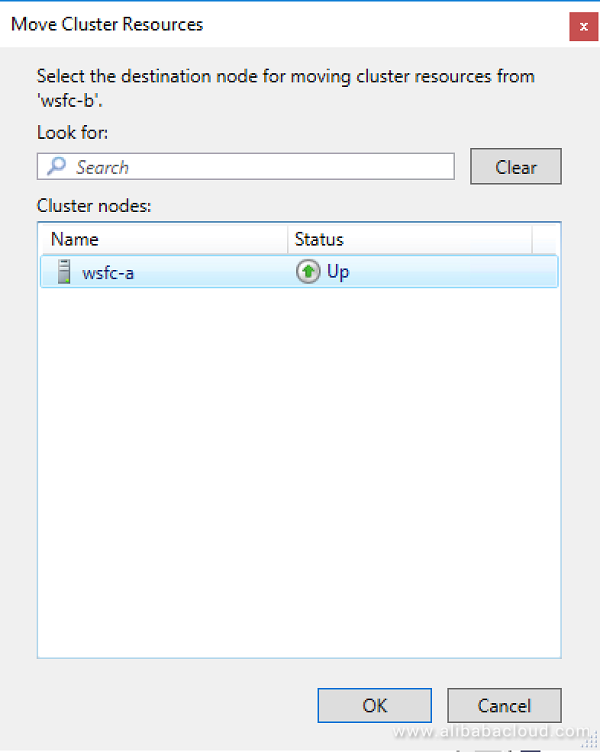 But, from WSFC perspective, the cluster resource is online for '192.168.2.110', in this case, it is wsfc-b that is the active node in the cluster setup. Next, we will try to simulate a failover and make sure the connection is working as expected. First, RDP to the ad-1 server, open a PowerShell terminal and we will start pinging the cluster. The current active IP is wsfc-b (192.168.2.110) in this example. Since the current resource is up on wsfc-2, we only see wsfc-1 here as candidate to failover the resource. Select the node and click OK to complete this action. The failover should complete very quickly, but if we go back to the ad-1 server, after refreshing the DNS, we can perform the ping again and notice that the failover is assigned to 192.168.1.110. To failback to the previous server, we can repeat step 5 above and we will see wsfc-b in the selection list. That's it! We have successfully created a cross-AZ failover cluster using Windows Server on Alibaba Cloud. 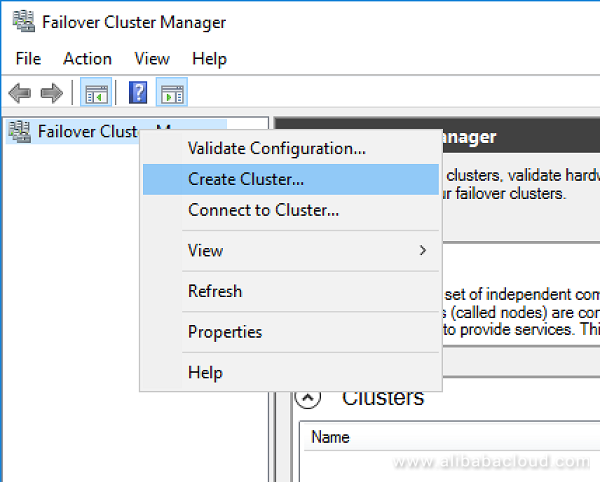 To read the other tutorials covering Windows Server Failover Clusters, SQL Servers and Windows Server Failover Clustering, you can visit: https://www.alibabacloud.com/getting-started/projects.